How to prepare the rabbit's nesting box in warm weather and in icy weather. 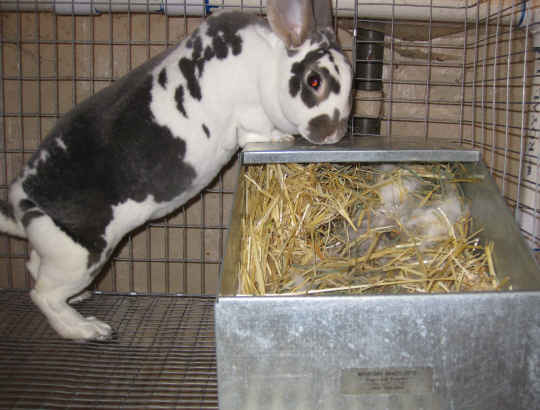 Help your doe prepare for her baby rabbits with timely and careful preparation of the nest box. Your doe needs a nest box in her cage before she gives birth. Day 28 after the rabbit mating is usually the ideal day to give her the nest. If you’re using all-wire cages, you’ll need a commercial nest box. In the coldest climates, wood boxes, or wire boxes with warm inserts, are best. We use metal nest boxes. Somehow they seem more sanitary to me, since I can dismantle them and scrub, even sterilize them of sorts, with bleach. A rabbit expert, Dr. Williamson, assures me that by dislodging all organic particulate matter after using the nest box, you can remove all the matter that germs like to live in, and that the wooden nest boxes are fine to use and re-use. 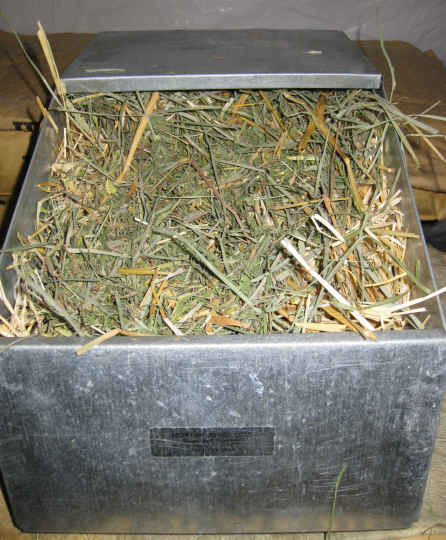 Ensure that the nest box is well-cleaned after using with the prior doe. I like to scrub the nest box well removing all remaining organic material, spray with a strong bleach solution (1:10), let sit for a half hour, then rinse both box and box floor well. 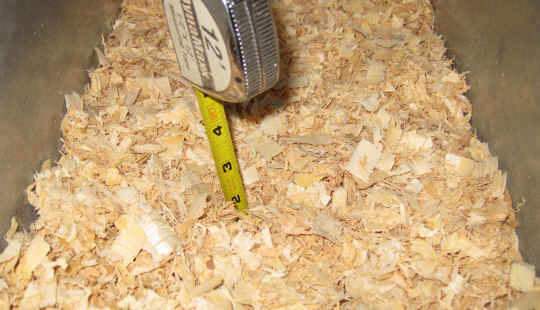 Place 1 - 2 inches of pine shavings in the bottom of the nest box. In the summer, 1 inch is fine. In wintertime, use 2 inches, or so. It's winter in Washington State, so I placed 2 inches in this nest box, and measured it for you. Usually, I just measure by filling the nest box with shavings up until the second knuckle of my longest finger. 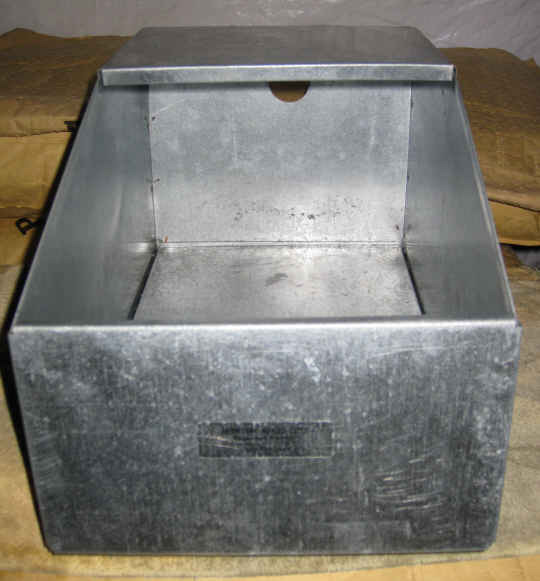 I prefer metal nest boxes, but this wooden box is sturdy enough to last through several litters. Clean well between uses. 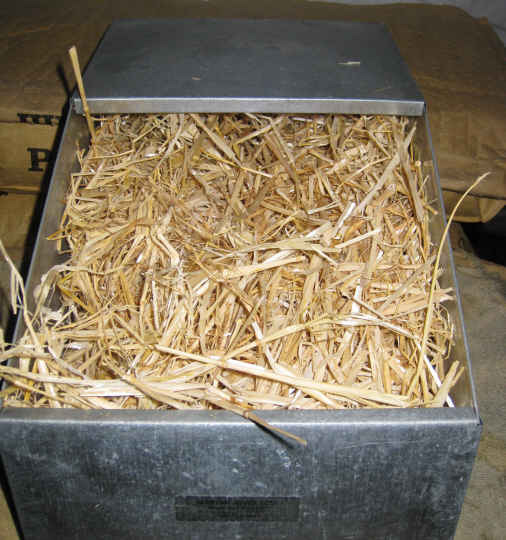 Fill the nest box loosely to the top with straw. Straw will help to insulate the kits, and the doe will chew some of it. Squeeze in some timothy or field hay at the very top of the rabbit nest box. Thrust your fist into the middle of the rabbit nest box, simulating a little burrow. Push your fist in quite a way, but not all the way to the shavings. I don’t think the does need the hint, but perhaps it makes their job a little bit easier. Lastly, place the nest box in the doe’s cage. Because you’ll be needing to check on the baby rabbits frequently (ideally every day), put the nest box where it will be convenient to your reach. 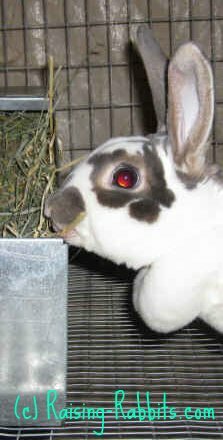 See Rabbit Breeding (Conception to Kindling) for more details. You'll put the rabbit nest box in the cage, and then observe the doe. She’ll just stare at you stupidly... She’s trying to fool you; she doesn’t want you to know she’s about ready to give birth. Okay, I don’t know if that’s true or not... Some does just don’t do anything, other than sniff the rabbit nest box and go lay down. Some does are mellow as jello. They’ll simply pull out a piece of straw or hay, and begin munching, content as can be. Some does look at you like, "Sheesh! What took you so long??" They’ll immediately plunge into the nest, and begin to dismantle all the lovely layers and thick carpet of shavings. They’ll stuff their jaws with more straw than they can possibly carry, and pace the cage, looking for the perfect place to build their nest. You’ll think: "Dang, I just gave you the perfect nest...use it, for Pete's sake!" And she will, after a while. But first, she’ll try to place the straw in this corner or that one. You’ll give up watching in frustration and head back into the house. In the morning, you’ll find she’s done an absolutely masterful job of nest-making! Now, both you and your doe can relax...until the big day.